Haemophilia is an inherited disease caused by the lack of a specific clotting factor in blood which leads to significant and sometimes life-threatening bleeding. Intravenous infusion of the missing clotting factor is used to treat and prevent bleeds. Regular infusion of clotting factor to prevent bleeding is called “Prophylaxis” and is usually self-administered at home by the patient or a family member. Prophylaxis from childhood is proven to prevent the development of severe joint disease and disability. Modern prophylaxis means that people with Haemophilia can achieve their full potential including taking part in sports, education and the workforce. Effective prophylaxis is tailored to the bleed rate and activity level of each individual patient. Although the development of clotting factor infusions in the 1970s and 1980s was life saving and life changing for people with Haemophilia, tragically contamination of blood products in this period meant that the majority of regularly treated patients with haemophilia were infected with HIV and/or hepatitis. Due to the ineffective manual methods used to record and track and trace the medication, patients were exposed to infection even after a product recall was initiated. The Haemophilia clotting factors used in Ireland now are not derived from blood but are recombinant products – produced by genetic engineering in cell culture based systems and subject to stringent safety procedures. However, experience has shown that unexpected events can occur and therefore it is vital that the Haemophilia treatment centre is able to identify immediately which batch and vial of product has been delivered to and administered to each patient and to be able to immediately locate and recall any vial of product even after delivery to a patient. The complexities surrounding the delivery of a multidisciplinary approach for the management of chronic illness, such as haemophilia, are well documented. Effective chronic illness interventions generally rely on multidisciplinary care teams. In the current environment, healthcare systems are confronted with the accelerating epidemic of chronic diseases coupled with increasingly effective, yet complex treatments for major chronic illness. Thus the heart of the chronic care model recognises that quality care is predicated on productive interactions between patients, their families and caregivers. Moreover, an informed group of chronically ill patients will, in the general scheme of things, possess a greater understanding of their condition, and know what to expect from the healthcare system. In order for this type of care programme to be effective it is important that the caregivers adopt a prepared and proactive approach founded on evidenced-based clinical information and delivered in a manner which optimises the maximum patient experience and produces better outcomes at both functional and clinical levels. Prior to the implementation of this service, patients who required home treatment received their medication by either collecting it from the local treatment centre or had it sent to them by post, courier or taxi. The combination of ad hoc delivery methods was irregular, inconvenient to the patients and prone to error. This use of non-validated cold chain delivery along with manual data entry to deliver and record product usage led to both product wastage and documentation delays. Validated cold chain delivery was therefore essential for the storage, distribution and delivery of Coagulation Factor Concentrates (CFC) to patients with Haemophilia, both within the home and Hospital environment. 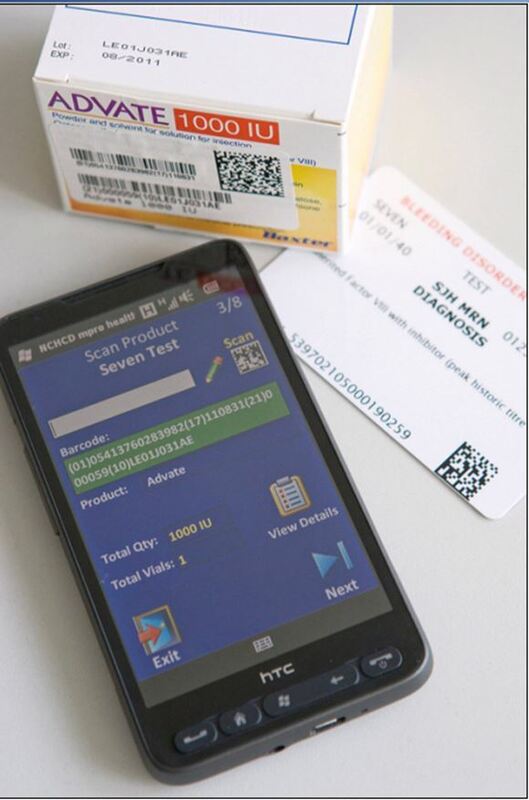 The main objective of introducing the App was to harness the power of the barcode to improve patient safety and outcomes by providing real time data on bleeding episodes to clinicians, monitor medication recording compliance and identify patients who may have received an “at risk” product and to facilitate a rapid recall. Just prior to self administration the patient scans the barcode on the medication. The scanning automates the previous manual tasks required by the patient (medication usage recording), which in turn increases recording compliance and accuracy. In addition, the patient records, via radio buttons and dropdown menus, the reason for infusion of clotting factor e.g. prophylaxis or acute bleeding. Using the strategy of “identify, capture, share”, all data collected from the App is transferred into both clinical and supply chain information systems in real-time. The patient also has the ability to view their treatment history via a secure web portal. Before the introduction of the App a treatment record sheet was provided with the medication delivery and patients’ were requested to manually record their usage and return the sheet to the treatment centre. Compliance ran at approximately 50%, in keeping with international findings. Although the delivery of haemophilia care is expensive, the lives of patients and their families can be transformed by high quality care. Effective prophylaxis and treatment prevents disability, and a need for orthopaedic procedures, later in life. A child born today with severe haemophilia can in effect look forward to a normal life expectancy. The SJH initiatives were delivered with cognisance of their potential to improve the Centre’s main objective of providing a patient-centred service, delivered to the highest standard of care, and in line with international standards. The EPR has streamlined many clinical and administrative processes, leading to enhanced productivity. For instance, the EPR allows access to patient records instantly at any treatment centre eliminating the need to fax, e-mail or transport records between the sites. Standardised data entry (ICD 10 Coding, Questionnaires, patient tracking through their appointment) have been used to drive Continuous Quality Improvement (CQI) schemes. Staff can refer to an instantly accessible, legible, clearly defined summary note with the treating doctor’s diagnosis and treatment plan. Medical staff can now access their patient’s records from home when on call, greatly improving the quality of care they provide patients. This aspect of the EPR is especially important for Haemophilia patient care, since since haemophilia is such a rare condition. A pre and post service audit was undertaken to assess the impact of the implementation of the validated cold chain delivery service. This audit showed that 221 patients received 30,464 vials of factor concentrate by cold chain delivery between August 2004 and October 2005. Product wastage due to failure of either cold chain conditions or delivery issues reduced from €90,216 in the period July 2003 - July 2004 to zero wastage for the period August 2004 – August 2005, again with the introduction the efficient temperature controlled door to door delivery service. A combination of the cold chain delivery service and barcode scanning has also contributed to greater visibility of all stock, including that held in satellite hospitals around the country. The value of the stock rotated (replacing short dated stock with longer expiry dates and using the short dated stock in large treatment centres) was valued at €600,000. This represents a potential yearly saving of that amount as before the introduction of cold chain delivery and barcode scanning there was no real-time visibility of that stock. 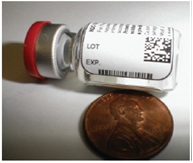 In addition, mock recalls can identify the location of 100% of a chosen medication batch within 10 minutes, along with quantities of alternate stock. Because patient infusion data is collected in real-time, clinical staff can view consumption trends and advise the patient if they feel they are treating themselves inappropriately (over treating or not treating at the appropriate time). This has lead to saving of €70,000 over a 4 month period, based on the first 20 patients using the App. The hospital has now over 100 patients using the devices. Medication recording compliance for those using the app is significantly higher (>80%) than those using the paper treatment sheets (<50%). Staff in the clinic is also alerted if a patient (who should be self-administering every 3-4 days) has not used the app to scan their medication for more than four days. This helps to monitor and audit compliance rates. From a patient point of view the data collected will help improve patient safety by providing important information on their medication status (alerts for prescription errors or out of date medication),—and on the patient population as a whole—that has not previously been available to healthcare providers, and other stakeholders involved in the delivery of clinical services to this patient population. Although the delivery of haemophilia care is expensive, the lives of patients and their families can be transformed by high quality care. Effective prophylaxis and treatment prevents disability, and a need for orthopaedic procedures, later in life. A child born today with severe haemophilia can in effect look forward to a normal life expectancy. These initiatives are delivered with cognisance of their potential to improve SJH’s main objective of providing a patient-centred service, delivered to the highest standard of care, and in line with national and international standards. The use of traditional paper chart provided retrospective and often incomplete data and was not always available out of hours. The implementation of an EPR allows for the standardised “once only” capture of key clinical information, in addition the electronic data is more accessible, accurate, and useful in the overall management of haemophilia and related disorders. With the smartphone app it is now possible to monitor and evaluate medication distribution to patient populations, identify gaps in distribution, and manage adverse events and consumption trends. The mobile phone app improves data quality and supports automation data capture, enabling secure data transmission from the patient to the treatment centre where it forms part of their EPR. This model of integrated comprehensive patient care for patients with haemophilia combines a number of novel initiatives including a national a validated cold chain delivery service, unique medication bar coding and a smartphone app. This template could be adapted to provide a systematic approach to improving health care for people with other chronic diseases such as inherited metabolic disorders, hepatitis and diabetes, allowing healthcare to be delivered more effectively and efficiently to other chronic disease groups. It could also be used in areas such as vaccine distribution, where forecasting and recall are critically important.